I’ve trained a telescope in on a nearby galaxy in the small constellation of Triangulum near the constellations of Andromeda and Pisces. The galaxy is M33 and is a member of the Local Group. I have to say that I’m quite pleased with my result, even with fairly short exposure times. A larger, full-frame view of the galaxy can also be seen here. Exposure and instrument information is also on that page. Much more about this object and image are below. Messier 33 is sometimes called the Triangulum Galaxy for it’s location in the sky. It is relatively close for a spiral galaxy of significant size and, as I said above, is a member of the Local Group. Indeed, of the galaxies in the Local Group, this is the third largest coming only after the famous Andromeda Galaxy and our own Milky Way. After this, the galaxies in our own cluster are much smaller in size. M33, or NGC 598 as it is also designated, is approximately 2.98 ± 1.20 million light-years (or 0.915 ± 0.367 mega-parsecs) away. (OK, you can round that to 3 million light years.) It’s approximate size is about 50,000 light-years across, which is about half the diameter of our own galaxy. M33 is also interesting because it has some very large star forming regions. Astronomers call these areas HII regions (the II here is a roman numeral 2), and they are made up of clouds of ionized hydrogen. The electrons are stripped off of the interstellar hydrogen by ultraviolet radiation from young, bright, and very hot stars that have formed within the cloud. These clouds grow to have very high temperatures, as well, on the order of 10,000 Kelvin. The result is that these clouds glow in the radio spectrum and often in visible light. Hence they are also called emission nebulas because they emit light. As a result they are visually red in color. (Nebulas that reflect light are typically blue.) The Orion Nebula is perhaps the most famous example of an HII region or emission nebula. It might be interesting to image the galaxy again with a narrow band H-alpha filter to see how much it bring out these regions. M33 contains the largest known HII region, a deep sky object cataloged as NGC 604. It shows up clearly in my photograph of the Triangulum Galaxy as a bright blotch with hints of red at the top of the galaxy a bit to the right of center. NGC 604 is estimated to be about 1500 light-years across on its longest dimension and several thousand times more luminous than the Orion Nebula. The image below shows the location of NGC 604 and a Hubble Space Telescope image of the nebula. A slightly larger size of this image can be seen here. In order to be clear about what object one is talking about, astronomers us a variety of catalogs of deep space objects to distinguish objects. There are a number of them which overlap. The oldest catalog of deep space objects was created by the French astronomer Charles Messier. Messier was a comet hunter, and produced his catalog as an aid to himself and others so that they could know if a particular nebulous patch was a fixed object or something not previous seen and worth further investigation. He published the first edition of his catalog in 1774 and it contained 45 objects. By the time he published is final version in 1781, it had grown to 104 items. Since then it has been found that his notes contain several other objects not in his catalog, and they too have been given Messier numbers, bringing the total to 110 objects. Because these are relatively bright and often quite interesting, the nebulae, galaxies, globular clusters, and open clusters in Messier’s catalog are popular objects for backyard astronomers and astrophotographers. The NGC numbers belong to a much larger catalog called the New General Catalogue which comprises a total of 7,840 non-stelar, deep space objects of all types. It was compiled in the 1880s, based largely on the observations of the famous and notable astronomer William Herschel and his son John. 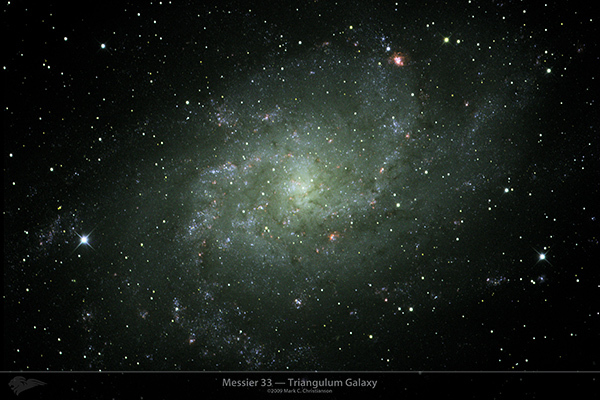 All the Messier objects appear in the NGC catalog, which is why the Triangulum Galaxy is both M33 and NGC 598. Why use these numbers rather than easier to remember names like the Andromeda Galaxy (M31), the Orion Nebula (M42), or the Spindle Galaxy (NGC 5866)? Such popular names can be confusing and inspecific. Some objects have more than one name. The open cluster in Cassiopeia that I posted an image of recently, for example, is often called the Owl Cluster. But it has apparently been called the ET cluster by some amateur astronomers. And some common names have been applied to multiple objects. There are at least three galaxies which have been called the Pinwheel Galaxy. There is the usual designee, the spectacular face-on, grand-design spiral in Ursa Major also called M101. There is the Southern Pinwheel Galaxy (M83) in Hydra. And the very galaxy imaged at the top of this post, M33, has also been called the Pinwheel by some. Meanwhile, weather in Australia hasn’t been cooperating with allowing time for the telescope in the state of Victoria to collect imaging data on the nebula I had planned to do next. Too many clouds and too much rain for an astronomer’s delight. But it’s still in the queue and waiting for good weather and the right telescope time.